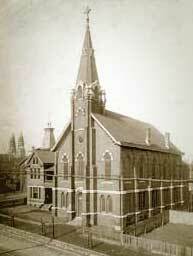 Unfortunately when the Trinity church building was built, a very inferior grade of brick was selected. From the very beginning the building was plagued with moisture seeping through the walls, and from the beginning the members of Trinity have been fighting to keep it out. A final solution was sought in the 1950’s with the very costly addition of a permastone facade. 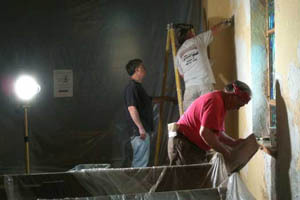 Mike Grant watches Jim Hofer and Phil Schmidt apply a final coat of plaster to the transept. Much of the hand carved limestone facade was cut away and the European Permastone facade was put in its place. The process took several months. Once it was finished, all of the crumbling stucco inside the church was removed and reapplied. During that time Rev. Victor Brugge died. In those days, most billboards were hand painted in place. This might take several days, so huge drapes were hung for the artists to work behind. Rather than have the public see Trinity with wood lath walls bare to the rafters, a member of the congregation borrowed a bunch of these billboard company drapes with which to cover the stuccoless walls. The inside of Trinity stayed dry for nearly 25 years. After that time, once again leaks started forming in the roof and then the walls. Pastor Phil Schmidt and the Trustees worked tirelessly trying to trace the source of the leaks, scraping decayed stucco, troweling on fresh and painting over again. It is estimated that at some time, every inch of stucco in Trinity has been replaced at least twice since the addition of the Permastone. Several years ago, Trinity hired the services of Mike Watermeyer, a water abatement specialist, as a consultant. Mr. Watermeyer has worked tirelessly with Trinity’s Head Trustee, Mike Grant, to help protect us from water damage. Much of the damage seen in the church right now is not a result of moisture coming through the walls, but through holes in the roof and the metal flashing around the steeple. We replaced the roof two years ago.We are currently in the process of recaulking and repainting the windows and applying waterproofing to the exterior walls. After all waterproofing is complete, work will start in again or removing and replacing the crumbling stucco and repainting the walls.